So it’s been five years to the day since I started my historical (or, well, historical-ish) Disney princesses series. I have no idea how it’s been this long – I feel like I drew some of these yesterday – but it seemed as good an opportunity as any to revisit Belle now that I’m five years older and wiser. And now that I’m way more into the 1780’s/90’s. I drew that original Belle on a whim, fueled by my sister’s time working as a costumed interpreter at Colonial Williamsburg, and assuming it would be a one-off piece. In the long run, despite all their now egregious flaws, I owe this series for some pretty cool jobs, meeting a ton of cool people, developing an unexpectedly voracious appetite for historical fashion, and eating a fair amount of humble pie along the way. I think this Belle probably marks the swan song of my historical Disney princess series. Much as I’d love to continue doing it forever, I’ve got a lot of exciting personal projects that I’m ready to dedicate more of my precious free time to. I’ll probably continue designing this stuff in my off hours – who am I to resist drawing the likes of Slue Foot Sue and Katrina Von Tassel – but I’m going to focus less on polished illustrations, and more on the research and design. When you get right down to it, that’s the aspect of this stuff that I love. Thanks to everyone who stuck with me over the past five years, and here’s to way more historical fashion in the years to come I can’t even put into words how lovely y’all’ve been. Just a little change. Small, to say the least. Your original design inspired me and my partner to do costumes a few years ago for DragonCon and it's still one of my favorites - I'm so excited to see your updated version! Thank you for the inspiration! Stunning!!! Can I ask if you take commissions at all? I have 4 ideas of different characters I would love to do in the Rococo fashion but I fail at design and would love to work with you if possible! I'm not, sorry! I list my commission status on my main page (and in my tag line). Mercy. I do believe Mademoiselle Belle's gown is just divine~! And my goodness, five years? One of my aesthetics is seeing the Disney Heroines/Princesses in historically accurate dresses. It would be nice if you updated your other Historical Disney Princess drawings, but I respect you wanting to pursue other projects. And again, Belle looks enchanting. Just incredibly enchanting. It's really like Marie Antoinette from the French Revolution! This is how I imagined Belle would look if the film had been more historically accurate. Also, Now I want the drawing to sing "A Change in Me" from the Beauty and the Beast musical. Oh you have no idea how much my historical French heart LEAPT at seeing this! And I love all the others too! Historical fashion is definitely one of my favorite things! So this is what Disney has come up with for their live action version for the yellow dress. Not nearly as elegant as the original animated one, and it seems like they didn't take the time to research the era-appropriate clothing either. Oh, they researched, all right. The other costumes were almost 100% spot-on to the exact decade. But Emma had creative control, and so the costumer worked to make this EMMA'S vision of Belle. Emma has no idea about fashion in that era, nor the fictional, protective role of corsets--they were not intended to make the waist tiny in an era when having some meat on one's bones meant having enough to eat, and so was more desirable than being stick-thin. The corset-ban was her at her insistence, all the changes to Belle that show her gross misunderstanding of life in the era, etc. While this dress is pretty in its own right (though why not at least embroider it or use crystals?--they don't weigh this gown down, which I know because I did it), it's not Belle, and it's jarring to see so modern of a gown in a movie very firmly placed toward the end of the 1730's when the rest of the costumes were as accurate as they were. "I read in Entertainment Weekly that you worked with Emma Watson to develop Belle’s yellow gown and that being active was an important part of the design. How did you incorporate design elements to allow for the physicality? [Watson and I] did try a lot of things because it was about how Belle is represented as a princess. So is it like the animation or do we try something else? We did try going in the direction of a historical 18th-century dress, and we tried going in the direction of something more modern, as a reinterpretation of an 18th-century dress. In fact, in the end it, came back to being closer to animation. But what we did with that silhouette was to try and give it a lightness and a fluidity and very little structure, so that Emma didn’t feel inhibited or trapped by it. That it was as light as it could possibly be, but at the same time had enough movement to work for the gown. It’s very wearable and it doesn’t have such a big skirt or have things that makes it impossible to imagine. What was it like working with Emma on that dress? It was very good. It was quite tricky, because she was working so hard to create a strong, individual, modern, emancipated kind of Belle. But at the same time, there are elements in which the yellow dress works against that in a sense of being a pretty, princess-y kind of dress. So to try and find balance and try an a yellow dress [that would] work for the new Belle that we’re creating was difficult and interesting. I think that we arrived at the end by making it quite simple and something that she felt she could really move in and be active in. In terms of the costumes, how was it for you to be a part of this more sophisticated and almost politicized update? It was good! Yeah, it was just [determining] what elements the dress needed to have in order to help Emma be her version of Belle." It was certain it shouldn’t have a corset. It was certain it should be something she should move in. It should certainly be not too heavy, but it should still have movement and everything and be beautiful for the ball. So if you're going to blame someone, blame the costume department on this. Duran thought she had been clever with the "tacky" elements. Also, it’s fantasy, not a true historical drama (that's what this whole series is about), and I'd say anyone has a right to be comfortable while shooting all day. The physical comfort of an actual person > “historical accuracy” when it’s not even an actual historical story. This would be a different scenario if it was fantasy but it's not. I agree in that the new dress definitely isn't my favorite for Belle's ballgown, but that image doesn't do the dress any favors. You can find some better images of it here. ahhhh yes this is much better! as lovely as your old pic is, this is much more accurate. and I love a good robe à la française! Omggg!! This is so pretty! I wish the live action version's dress looked this good! As per the description, I'm not planning on continuing this series! I am so stunningly impressed. I've always loved your series, and as someone who is a Disney fan comboed with being a huge history fanatic they're fun to share with my friends and new cosplayers. I adored your original Belle, but did notice she was probably the most loosely interpreted of your series. Honestly though, even the Disney dress was loosely interpreted and leaned heavily on mid 1800s British ball gown styles. Still, she was the first, my favorite Princess of the pre-1995 films, and extremely beautiful. I like that you've come back full circle to do your 'swan song' with a new and extremely historically spot on Belle. The funny thing is, I'm pretty comfortable with a number of French/British paintings so I can actually see which portions of the dress were inspired by these paintings which I find wonderfully fun! You've even given her that regal, sultry, sleepy-eyed look that was so prevalent in the French court portraits! I do love though that you gave her cloth (I'm assuming, with royals you never know) roses instead of simply bows, it's a detail like that that I think really shows your personal aesthetic. Basically, both of your Belles are amazing and I admire you greatly for all of the work and research you've put into your whole series. I was the one (I think the only one, let me know if I'm wrong) who asked if Belle's sleeves really would be as short as in your original version, and you told me no and that you'd like to revisit it after 2 years. I am happy to see you made her gown way more accurate now! But I must say, I find the original Belle you made to be the most gorgeous one. Maybe if you combined this Belle's top with the old Belle's skirt, it would be accurate and so gorgeous. But this one is very pretty, and, of course, gotta love that it's more accurate! Thank you for making it! I wonder if a gown like this will be what we see for Belle's gold gown in the new live-action version of Disney's Beauty and the Beast! the old skirt wasn't accurate either, I'm afraid! But thanks for the kind words. Oh, but I thought the skirt looked like something from the 1700's, like that Marie Antoinette would have worn. Anyway, I also liked the bodice from that one best. And I don't see why, for dancing, she'd have the cape you gave her in this new picture. 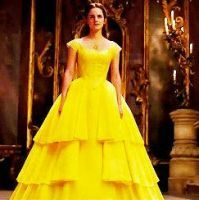 I saw a picture of the dress the Emma Watson Belle will wear in the live-action Beauty and the Beast, and if the picture is correct, it will be plain, boring, and very historically innacurate in the film. I wish either of your gowns was the dress in the film! They're so beautiful and more accurate! it's not a cape! It's a Robe a la Francaise. Oh. Ok, looking that up, I guess she would wear it even during dancing? But in one picture you made, you said it might be a "sack back"? and here i thought the older piece was gorgeous! your art has developed so much and come so far since the first version! though your historical disney princess line was what made me follow you, your art as a whole is masterfully crafted and a huge inspiration for me and no matter what you do or where you go, i'll always be a fan. here's to a future of further success!!! Hello! I was winding if it is ok with you that I can try and make a cosplay of your design? I will give you proper credit of course. I just wanted to double check for permission. of course, thanks for asking! I'd love to see photos when you're done if you want to share them. I enjoyed the first round, and this one is a definite improvement. Brava! Oh, I've seen these illustrations go by so many times on tumblr. Lovely to see the artist behind them. Kudos to you. They're so lovely! I loved your series since the first one came out! I'm a little sad to hear it's over but good things come to an end too! This Belle is a lot truer to the period than your previous one, either way they're both gorgeous. Thank you for some amazing pieces! Seeing this, I get flashes of The Duchess in my head. I love that sooo much. Your stuff is always breathtaking for me. Super cool that you revisit your older creations! I would FALL OVER seeing your Katrina Van Tassel. In fact, (before the project got canned), I was part of a team working on a newly-illustrated version of the piece. It involved me and my period-accurate curves getting shoved into a corset (it was the worst hour of my life, let me tell you). Gorgeous progress, and congratulations on having done this for so long! So glad for you, about how your path has progressed, too. Whet about the rest of the Princesses? Merida? Elsa & Anne? Yup, you're definitely the four thousandth person to make that joke in the past month. - I'm not telling you which princess I'm doing next. - I would appreciate it if you didn't tell me what character I should do next, or what you're looking forward to, or what character you hope I'll do! It's very sweet and I definitely appreciate the sentiment, but consider the fact that you're something like the 400th person to tell me about Elsa, or Anna, or Merida- it's not adding a lot to the conversation. - No, I'm not doing any Kingdom Hearts characters. There's no particular historical precedent, so they don't really have anything to gain from this series. Are you going to do Merida? Are you going to do Elsa and Anna? Are you going to do any more pieces in this series? Yes! Let it be assumed that I will continue doing these until stated otherwise. Why not have just posted that last one; "Historical Disney Princesses FAQ"?